In Japanese Whisky we trust. 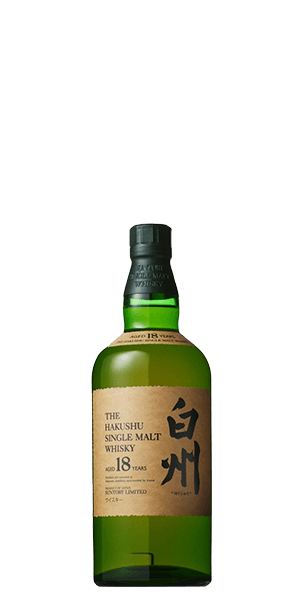 And after savoring a dram of this Hakushu 18 Year Old Single Malt Whisky, you better be damn sure you will, too. Hakushu imports peat from the other side of the world to craft an authentic, smoky taste that pairs perfectly with the fruity sensation that’ll wash over your palate. Japanese distillers are killing the game. And we’re enjoying every moment of it. What does Hakushu 18 Year Old taste like? The Flavor Spiral™ shows the most common flavors that you'll taste in Hakushu 18 Year Old and gives you a chance to have a taste of it before actually tasting it. Fairly smooth at first with a spicy & woody finish. Fruity undertones. A hint of almond at the end, maybe a wiff of butter. Definitely tangy and oaky with a bit of smoke. Spiciness is like a mild wasabi. Not as smooth as I would expect for an 18 year, but still a quality dram. the blend of this is amazing. i was so happy to get my hands on this for such a cheap price. if you come across this spend the money and get a bottle you wont be disappointed!